Caribbean aircrew in the RAF during WW2 » Blog Archive » BARNARD – D.B. 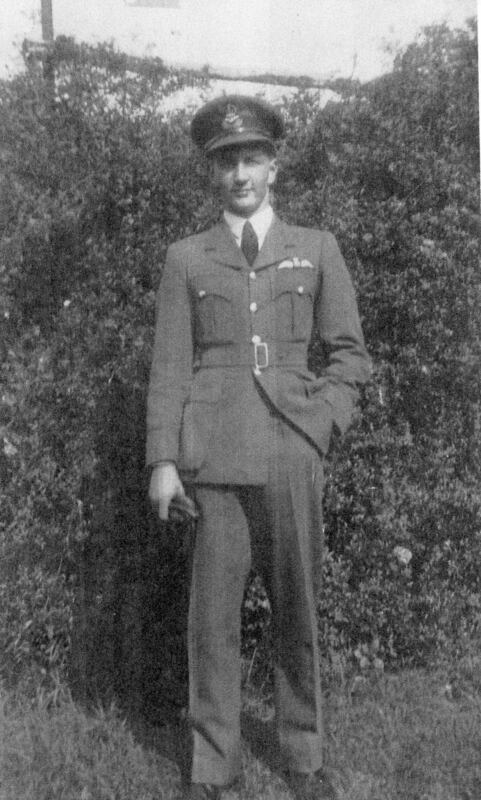 Flight Lieutenant Donald Beausire BARNARD (40352), No. 142 Squadron. This officer is a sound captain with a long record of good operational work. He invariahly presses home his attacks in a determined and fearless mannet His skilful airmanship has on many occasions resulted in the target being attacked successfully, despite the heaviest defences. He has made manv flights to the Ruhr areas. Dismissal by sentence of General Court-Martial. Sqn. Ldr. D. B. BARNARD, D.F.C. (40352). 17th Jan 1946. My comment #4 need correcting. After he was shot down in 1942, S/Ldr Barnard evaded through France to Spain with other allied airmen. The book RAF Evaders reports the temper flare-up between him and another escaper. RAF aircrew who passed through the Resistance Underground Line had two choices on returning to England – taken off Operations or transferred to another theatre of operations. S/Ldr Barnard chose the latter and was transferred to the Far East. It was there, presumably in 1945 he was Court Martialed for making two unauthorised flights – it appeared he was dissatisfied with the slow speed at which POW’s were being repatriated and took matters into his own hands, against orders. Considering the physical state of allied POWs in Japanese hands, one cannot help but admire S/Ldr Barnard’s actions. 19 Sep 44 No 109? ?/could be 108 OTH 44 gr area Looks like OPL trng? 27 Dec 44 No 525 Sqdn 479 gr area Flying Supply. 2 Feb 45 HQ No 229 Grp Flying Supply. 15 Nov 45 3 R.E.6 ACSEA area Pilot release. Dons report on his debriefing mentions Lieut Smith, USAAF but makes no mention of any incident. Sounds as P/O Glensor was with them, but he is dead now of course. I also have the following: However I have traced a fellow officer who served with him in the Far East. I have established that as a result of an action taken by Donald he was in fact Court Martialed and dismissed from the service. I will immediately add that his action was an honourable one, many men doing similar acts would have been rewarded with medals. I will quote from one letter. He in fact flew to collect prisoners of war who were stranded and awaiting collection. He was frustrated with the lack of action in collecting them. This additional information provided by Duncan Richardson. In Mr Oliver Clutton-Brock’s book “The Evaders:” it is written that Donald Barnard “lost control of himself and, in a yelling frenzy, threatened to kill Smith for no apparent reason” Smith being an American flying officer who had joined up with Barnard and others in the trek from France to Spain. I have discussed this with Donald’s relatives and they remember him as a reasonable man, with a strong sense of duty, but one who would stand by his convictions. He never had an ungovernable temper, very unlike the man described in the book. Apparently that aspect of the story may have originated from a book published sometime ago. His nephew has been in touch with Mr Philip Caine, a distinguished Amercan author, who advised that his source, from whom he quoted in his book book “Aircraft Down”, was Robert Smith himself. Smith has now died [so of course has Barnard] and there remains no evidence of this incident other than the unsubstantiated word of Smith in the interview he had with Mr Caine. Squadron Leader Donald Beausire Barnard D.F.C. was an outstanding pilot and it is unfortunate that the reported experience of one man should distort his reputation. Clearly here were two men from countries far apart forced together in extremely trying circumstances. Americans in Britain for many reasons were not always beloved for their efforts and no doubt here was an example of two cultures in conflict. Something Smith said or did may very well have agravated Barnard and he spoke his mind. That he would become uncontrollable and seriously threaten to kill is highly unlikely and firmly disputed. Donald Barnard is no longer with us. He cannot defend himself and we will never hear his side of the story. Given all that is known about him otherwise, this one sided account is open for reasonable doubt to prevail. “Unwanted Hero” on the RAF career of Donald will be published in the autumn of 2012. Unwanted Hero. The Flying Career of Squadron Leader Donld Barnard DFC by Colin Pateman and Oliver Clutton-Brock is now availble in the UK I obtained a Kindle copy. I would be very interested in reading “Unwanted Hero”, due to the possibility of being a distant relation. Unwanted Hero, tells the story of Donald Barnard who came to England from St Lucia to join the RAF as a bomber pilot. On his second tour of operations, he was shot down over northern France in September 1942. He was rewarded with the Distinguished Flying Cross whilst missing in action. Donald evaded capture; helped to Spain by an escape network, and later compiled a detailed diary of his entire evasion exploits. Posted to test fly Spitfires, flying in excess of 1,000 individual aircraft, Barnard then moved to the Far East to take part in supply dropping in 1945. In Burma, disapproving of the delay in recovering the emaciated allied POWs, he decided to take an aircraft without authority and recovered 25 prisoners. After a full Court Martial, he was dismissed from the RAF. We’re designing a permanent visitors’ centre at Langham Dome, Norfolk, UK, to educate the public on RAF Langham’s use during and after WW2 as an anti-aircraft training base and to commemorate those who served there. I am writing to request permission to use the above image in the exhibition. They would be a great contribution to the display. The visitors’ centre is entirely non-commercial and we would of course credit the photos appropriately. If possible, I would be grateful to acquire a high resolution version of the image as soon as possible, as we are nearing our deadline. Please get in touch if you have any queries about my request. I hope to hear from you soon. Good Afternoon, My name is Faye Barnard And this is my great, great grandfather. Its such an honor to see this book has been made. I live in St. Lucia and have heard so much about my family history its amazing that the world can see a piece of it too. My father in law, Norman Davies was the navigator on the flight with Squadron leader Barnard. See interview http://www.walesonline. co.uk. 3rd November 2010. Norman has an excellent memory of the event and has his log book with full flight details.Norman would be very happy to provide more details of the mission. I would be very interested in learning more about their epic flight to Rangoon and why the RAF took such strong action against Donald Barnard Is there anyway we can get in contact? Above is the email address of my father in law.He would be delighted to hear from you. My father in law would be delighted to hear from you at the above email address.